India 503 (Cheteshwar Pujara 204, Murali Vijay 167, Glenn Maxwell 4-127) beat Australia 237 and 131 (Ed Cowan 44, David Warner 26, Ravichandran Ashwin 5-63) by an innings and 135 runs. The dismal batting of the Kangaroos followed them in the second Test as well where they were bowled out for 237 and 131 in their two innings respectively whereas the Indian batsmen scored a gigantic total of 503 in the only innings they played. 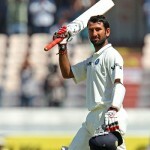 Cheteshwar Pujara (India) was declared ‘Player of the match’ for his outstanding innings of 204 runs while batting at the top order. The second Test of the four match series was folded back by the home side on Tuesday, March 5, 2013, that was the fourth day of the game. Earlier, the visitors went into bat at 2-74 in 32 overs, Ed Cowan and Shane Watson were fighting at 26 and 9 runs accordingly. The first two overs ended as a maiden and Watson became the first victim on the last ball of the next over without adding any run to his overnight score. 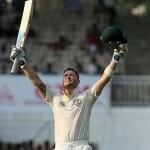 The Australian captain, Michael Clarke, joined in next with Cowan and the duo survived a couple of strong appeals. Clarke hit the first six of the day in the 40th over and the first hundred of the innings was posted on board in the 44th over. Clarke did not stay longer and was clean bowled by Ravindra Jadeja for 16 as Cowan was dropped at 44 on the final delivery of the 47th over. The latter could not utilise the chance and was caught by Virender Sehwag at slip off Jadeja for 44 from 150 balls with 6 fours. That was the start of a disaster for the tourists as the home spinners took over from there and never looked back. Matthew Wade was the only batsman who touched the double figures by scoring 10 runs off 28 balls whereas the rest of the batsmen found it hard to tackle the brutal bowling of India. 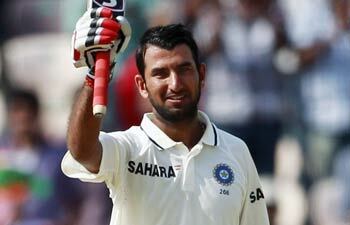 The entire team was sent back to the pavilion for 131 mere runs in 67 overs while consuming 237 minutes at the crease. Ravichandran Ashwin was the most destructive bowler and grabbed five important wickets. Ravindra Jadeja held three whereas Ishant Sharma chipped in with one. India outplayed Australia in every department of the game and won the encounter by a vast margin of an innings and 135 runs. The hosts lead the four Test series 2-0 and the next match will commence from March 14, 2013, at Punjab Cricket Association Stadium, Mohali, Chandigarh. MS Dhoni, the Indian skipper, became the most successful Test captain of the country after winning 22 games out of 45 surpassing Sourav Ganguly who won 21 out of 49.